“Regardless of our views on horse racing we cannot turn a blind eye on these equines at risk, it is our calling!” ~ R.T. In Saturday’s TDN we reported on the situation at Camarero Racetrack due to Hurricane Maria (click here to view the story). 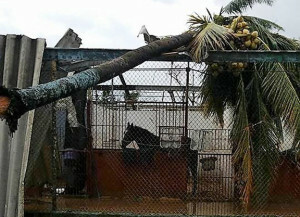 Shelley Blodgett, founder of the Caribbean Thoroughbred Aftercare Inc., wrote the following response to the TDN to further explain the severity of the situation and ask for help from the industry. Blodgett also sent all of the photos and graphics included. I am Shelley Blodgett, co-founder of Caribbean Thoroughbred Aftercare Inc, a non-profit (501c3) that helps Thoroughbreds racing in Puerto Rico and the U.S. Virgin Islands. I think there is a story that needs to get out. Monday, May 6th at 8pm edt, Internet radio host Candelo Kimbisa welcomes Yoruba scholar, filmmaker and author, Dr. Marta Moreno Vega to Candelo’s Corner. Dr. Marta Moreno Vega has dedicated her professional life to developing culturally grounded institutions, and placing the history and culture of African descendants in the Diaspora onto the time clock of world history. She is founder and president of the Caribbean Cultural Center African Diaspora Institute, an international non-profit, created in 1976. She has conducted extensive research in Yoruba Belief systems in the African Diaspora and has organized three international conferences uniting scholars and traditional leaders who are experts on these religions. When the Spirits Dance Mambo was directed and produced by Dr. Moreno Vega, who also authored a book by the same title. Filmed in Cuba, this documentary focuses on the impact of Santeria on the Civil Society of the island. She is co-editor of Voices from the Battlefront: Achieving Cultural Equity and author of The Altar of My Soul: The Living Traditions of Santeria. Dr. Moreno Vega’s current project, Let The Spirits Move You, is a celebration of ancestral belief systems that are a proud and important part of our cultural legacy as African descendants. The documentary focuses on the African based spiritual traditions that continue in Puerto Rico grounded in ancestral worship – espiristmo.